XICHANG, Sichuan - China successfully launched the "SinoSat-6" satellite for radio and television live broadcast at 12:14 am Sunday from the Xichang Satellite Launch Center in southwest China's Sichuan Province. 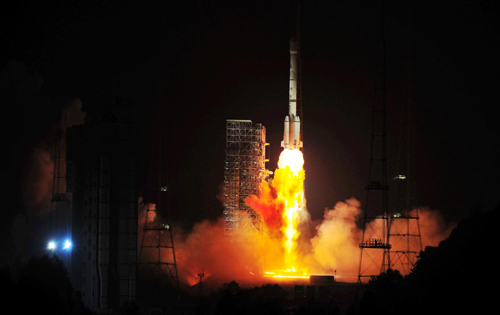 The satellite was carried on the Long March 3B rocket which took the SinoSat-6 into a geostationary transfer orbit 26 minutes after the launch. In the following days, Xi'an Satellite Control Center and Yuanwang tracking ship will manipulate the satellite's position and transfer it to enter the geostationary orbit. SinoSat-6 has a designed lifespan of 15 years and will eventually work at longitude 126.4 degrees east about 35,700 kilometers above the equator, said the China Aerospace Science and Technology Corporation (CASTC), the satellite's researcher and producer. It will mainly serve for relaying TV and radio live broadcast signals and will greatly improve cultural life for people living in remote and mountainous regions, according to China Satellite Communications Corporation which will operate the satellite. China has launched the first SinoSat series satellite, SinoSat-1, in 1998. The SinoSat-2 was launched in 2006 but malfuctioned for it failed to deploy its solar panels and communication antennae. SinoSat-6 will serve as a substitute for SinoSat-3 which was launched on June 1, 2007, according to the China Aerospace Science and Technology Corporation.